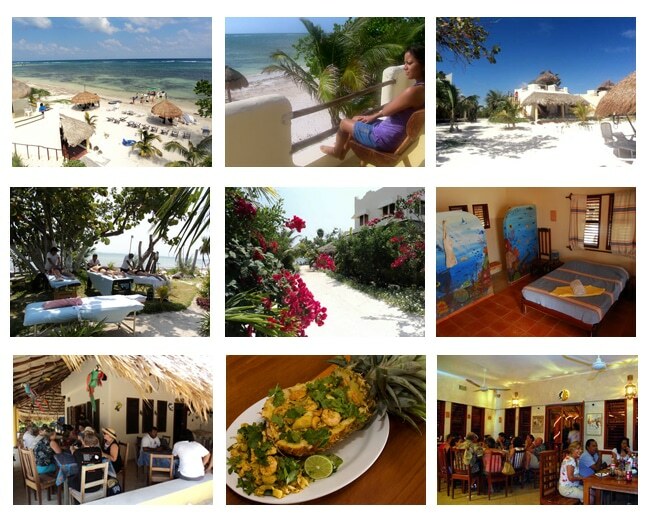 Have you ever dreamed of owning an eco lodge in the Mexican Caribbean? Look no further for a prime property! Maya Luna is a small, cozy hotel on the Caribbean coast of Mexico, the Costa Maya in the south-eastern part of the Yucatan Peninsula. The second largest, living coral reef in the world passes just in front of the beach. Maya Luna offers excellent opportunities for diving, snorkeling, fly-fishing, trawling and bird watching. The beachfront restaurant offers a daily variety of Mexican, Oriental and European flavors. If you want to be away from the madness of daily life, Maya Luna is the place where you can relax, read and reflect in a warm, natural, unspoiled environment. Hotel Maya Luna is located two miles south of the important Mexican-Caribbean cruise ship port and little fisherman’s town MAHAHUAL, known as Puerto Costa Maya. It is a 4.5 hours drive from the international airport of Cancun, at 360 km (219 miles). Chetumal, at 140 km (89 miles) and 1.5 hours, has a national airport with flights from Mexico City. There are daily bus services from Costa Maya to Cancun and Chetumal. Most tourists arrive in rental cars. Maya Luna is owned by a Dutch couple. They built the resort in 2003. Their mission-statement: Maya Luna must be an eco-resort where the guests feel at ease, the Mexican employees gain a rewarding living and the owners make a fair profit. The resort counts four spacious beach front bungalows that all have a beach terrace downstairs and a private roof deck upstairs, a king size bed or individual beds, bathroom, toilet, closet, hot & cold water, drinking water, beach chairs, hammocks. One of the bungalows is fully equipped for wheel-chair travelers. The two floor main building: Downstairs consists of a beach front restaurant, fully equipped kitchen, reception, palapa-covered patios, public toilets, and storage. Upstairs has two rooms, storage and a huge ocean view terrace. All the buildings and parking places are situated in beautiful, tropical gardens. The eco-resort runs 24 hours on a solar panel system with back-up generator, rainwater with big cisterns and septic tanks for the dirty water. Wireless and cellular telephone are available.